Dropped internet connections, lost luggage and phantom hotel reservations are just a few of the frustrations faced by the typical business traveller. Can tech combat modern slavery? But a range of new technologies are helping to make the process less arduous and more productive. And with UK business trip expenditure expected to top $42bn (£25bn; 31bn euros) by the end of 2014, according to the Global Business Travel Association, productivity on the road is becoming a business essential. This requires seamless connectivity wherever you are in the world. In reality, travellers have to navigate a multitude of hotspot "providers, prices and passwords adding to the complexity", says Evan Kaplan, chief executive of wi-fi service provider, iPass. As a result, European companies waste at least £2.4bn a year in unmanaged connectivity costs, he says. And 53% of travellers feel the wi-fi services currently available at airports are pretty poor. The iPass solution is to act as a "hotspot aggregator", whereby a single log-in gives users automatic access to more than 150 network operators across 2.7 million hotspots around the world. "Through these agreements, iPass can enable its subscribers to roam seamlessly onto any of its partner networks," says Mr Kaplan. "[It is] simpler to navigate, and more cost-effective." The company claims its service can cut data roaming costs by 50% to 73%. Several airlines are beginning to introduce in-flight wi-fi as well, enabling long-haul passengers to stay connected and productive. 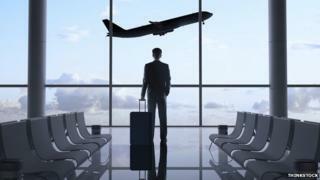 Connectivity is one issue for the business traveller, a feeling of anonymity is another. So some travel companies are using technology to personalise their services. For example, travellers using Virgin Atlantic in May and June may have been surprised by a new service being trialled by the airline. It installed Apple iBeacons at its Heathrow airport lounge in an attempt to personalise the pre-flight experience. These transmitters use low-energy Bluetooth technology to notify passers-by of nearby services, discounts and flight schedule updates, via their Apple smart devices. "We could use the passenger's location to help direct them to the lounge or gate area," says Tim Graham, Virgin Atlantic's technology innovation and development manager. "Or we could link back to their preferences or previous behaviour to provide them with a unique service or offer." Furthermore, the airline could use iBeacons to identify an approaching passenger so an agent could "greet them in a more personal way", he says. "Many of these passengers travel a lot, so anything we can do using technology to make their journey that bit more memorable is key," adds Mr Graham. How else is technology helping to make business travel more economic and efficient? According to Geraldine Calpin, senior vice president and global head of digital at Hilton Worldwide, her hotels are "putting innovation and digital tools at the forefront of what we do, in order to stay ahead of the game". Image caption Hilton's Geraldine Calpin says the company is "putting innovation and digital tools at the forefront of what we do"
The aim, she says, is to empower guests through their entire journey, "from booking to check-in to departure". Hilton's Conrad Concierge service for customers of its luxury Conrad Hotels & Resorts brand, can check in online up to 48 hours in advance using a dedicated app. They can also order room service at a moment's notice, book a room for a business meeting, or even order extra towels. Hilton is also trialling Google Business Photos - a spin-off from Street View - which allows businesses to take 360-degree virtual tours of a hotel's facilities before booking. Douglas Rice, chief executive of the trade group Hotel Technology Next Generation, says that hotels are experimenting in other ways, too. Some are trialling "location services that can alert them, for example, when an arriving guest has landed at the airport or gotten to within a mile of the hotel". And chains like Starwood have piloted "mobile locking", whereby travellers can check in and open their rooms with their mobile phones. Anything that makes the registration process easier has to be welcome. Technology can also help business travellers with the perennial annoyance of losing bags in transit. According to the industry technology provider SITA, about seven bags per 1,000 passengers went missing in 2013. Today's tracking systems rely on barcode technology that is printed on a tag and stuck to the bag. But airports, such as Hong Kong International, Italy's Milano Malpensa, and Denmark's Aalborg International, have introduced radio-frequency identification technology (RFID) to make the process more accurate. "Put simply, RFID chips react to radio frequencies and return their own 'signature'," explains Carlo Gagliardi, co-lead of PwC's digital practice. "The chip can be located some distance from the reader, while a normal barcode needs the reader to be close to the barcode itself." RFID systems have achieved "read rates" of 99% in some cases - but the chips need to get smaller and cheaper if they're to become widespread, Mr Gagliardi admits. There is an elephant in the room, however, and its name is video-conferencing. This technology theoretically removes the need for business people to travel at all, potentially saving billions in costs and drastically reducing companies' carbon footprints. Free online video, voice and text services from the likes of Skype would seem to make the business case compelling. But Tudor Aw, partner and technology sector head at KPMG, says video-conferencing just has not taken off in the way that many people predicted. "High-grade video-conferencing facilities are still relatively expensive to install and many organisations understandably do not want to go with cheap or low-quality alternatives for important meetings," he says. Hotel Technology Next Generation's Mr Rice adds that, while the internet certainly has had an impact, it has not reduced "the need, or the desire, to meet people face-to-face". So while traditional business methods persist - and the real world trumps the virtual - people will continue to travel. At least there are some technologies around helping to make this sometimes arduous process more seamless, friendly and productive.